Originally appeared in the August 2, 2012 edition of the Southside Times. With tomorrow being opening day for the 2012 Indiana State Fair, I thought it apt to emulate the deep-fried traditions of the Main Street walkway. 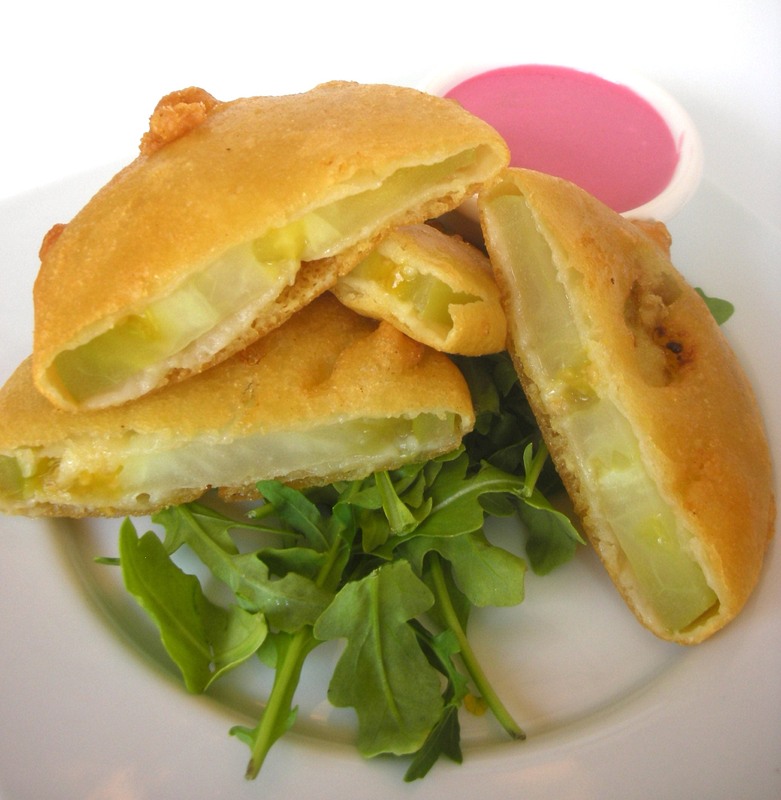 Specifically, the venerable, fried green tomato. Of course there are numerous types of batters for deep-frying—tempura, egg-white, cornmeal, and beer batters are the first to come to mind. So what I’ve created for this week’s recipe is a sort of hybrid, intended to please as many palates (ideally uninjured after sampling your deep-fried products) as possible. First, when deep-frying at home (and I’ll invoke my father’s indefatigable advice), you can never be too careful—unless you’re using a pint-sized electric deep fryer, place your fry-pot on the back burner of the stove; and second (to invoke the shrewd demands of my former chefs) it’s critical that you maintain quality control—prepare everything in an assembly line from beginning prep to plating. And what’s that purple concoction in the background? I’m, glad you asked. No tricks here: sweet beet dipping sauce, which is mind-numbingly simple. All you do is incorporate a desired amount of canned-beet juice to mayonnaise. That’s it—a pretty conservative shortcut that pairs nicely with a deep-fried icon. 1. In a heavy-bottomed stockpot, add enough canola oil to reach hallway up sides of pot. Using a candy thermometer, slowly heat oil to 375° F., and maintain at that temperature. 2. Slice tomatoes into ¼-inch discs. In a bowl, combine egg and beer; whisk until smooth. In a separate, larger bowl, combine flour, baking powder, kosher salt, and cornmeal; whisk to combine. Whisk the beer-egg mixture into the dry ingredients until batter is smooth. 3. Place a small amount of all-purpose flour on a plate, and dredge each piece of tomato by lightly coating it with flour before immediately dipping the tomatoes into the batter (the flour will help the batter stick to the tomato). In small batches, carefully place the battered tomatoes into the fry oil. Gently flip the tomatoes after a minute or two, and fry until golden brown (this will take several minutes). When crispy and golden, remove tomatoes, reserve on a small rack, and sprinkle with additional kosher salt. For dipping sauce, combine desired amount of beet juice with mayonnaise. Serve fried green tomatoes immediately. Originally appeared in the May 24, 2012 edition of the Southside Times. 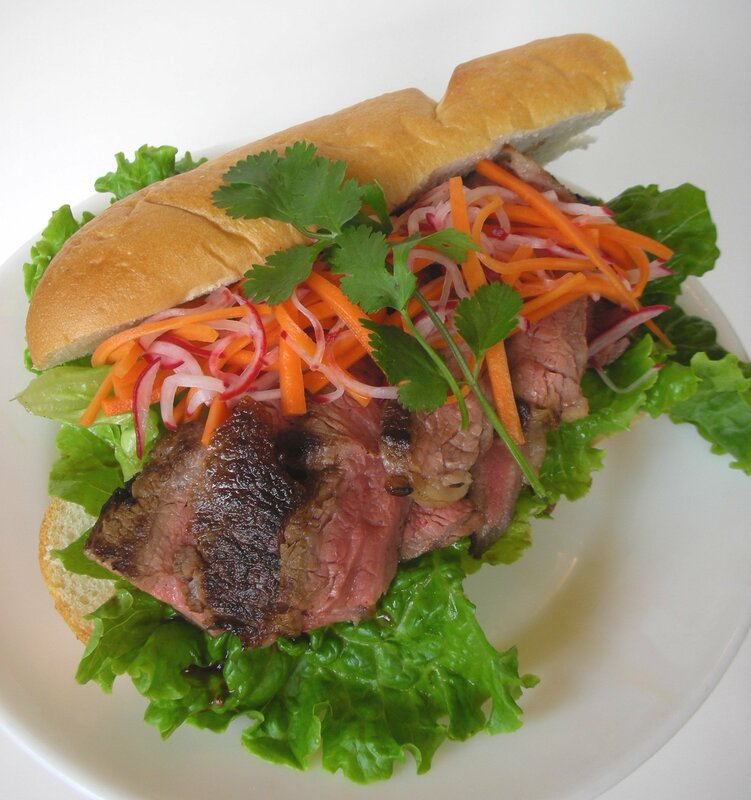 Here’s a decent little dish—one that combines ease-of-execution with a sophisticated presentation. Because of its firmness, orange roughy is an ideal fish for pan-searing; and cooked properly, the product yields a flaky and silky texture. Searing in a sauté pan (particularly in a non-stick variety) takes some finesse. But the secret comes down to these three things: hot pan, hot fat, then add your product. Set your pan over medium-high heat for several minutes. The trick here is to ensure even heat distribution. Add an even installment of olive oil, enough so that it thinly coats the bottom of the pan. I like to add just a small knob of unsalted butter at this point. While the olive will cook the product, the butter will provide golden color and a bit of richness to the exterior. Then it’s on to your fish. Gently settle the orange roughy into the pan. And here’s one last pointer: resist temptation and leave it alone. Allow the heat of the pan and fat sear the fish, and you won’t have to worry about it sticking. 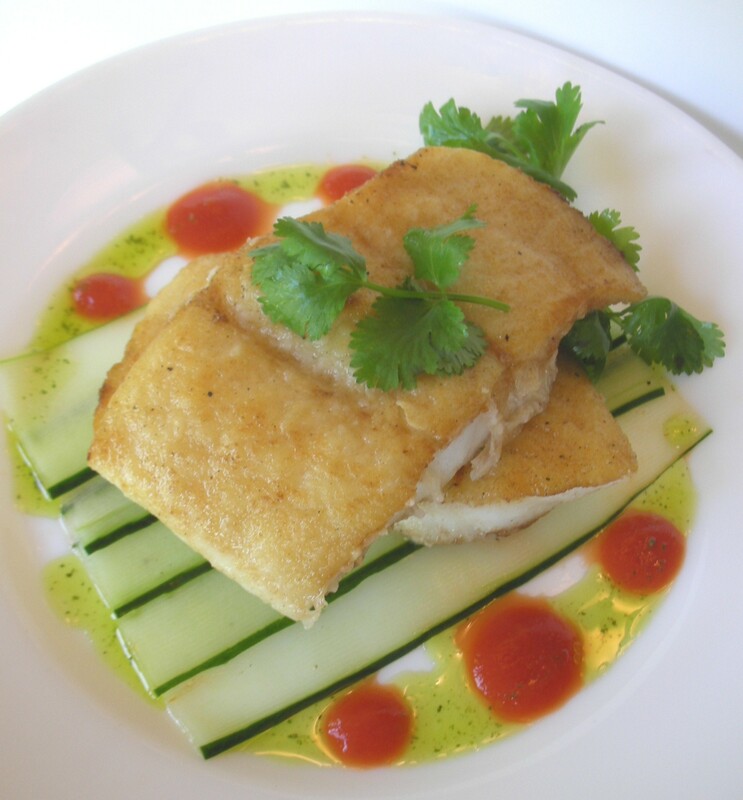 Enjoy—the trio of fish, cucumber, and tomato makes for a light lunch or sophisticated dinner. 1. Using a peeler or mandolin, slice cucumber wafer thin lengthwise; place in a bowl and drizzle on a small amount of olive oil, vinegar, and season with salt pepper. Set aside. 2. Place a sauté pan over medium-high heat; allow pan to accumulate and even distribution of heat. Add oil, coating the bottom of the pan, and add butter. Season fish with kosher salt and cracked black pepper. Dredge fish fillets in all-purpose flour by placing in flour and shaking off excess. Gently place fish fillets in sauté pan, searing both sides to golden brown. 3. For sauce: In a separate sauté pan, sweat onion with small amount of oil; add tomato and heat briefly. Add mixture to food processor and puree until smooth. Return to sauté pan and reduce over moderate heat. Remove from heat and swirl in butter. Strain through fine mesh strainer or cheesecloth. Serve immediately with marinated cucumber and fish. Originally appeared in the May 3, 2012 edition of the Southside Times. With Cinco de Mayo approaching this weekend, you could pay a friendly visit to your local Mexican restaurant, order up some fine cuisine and a sweet-and-salty margarita. Or you could procure some fine ingredients, carve out some kitchen time, and produce a classic Mexican dish on your own. The often erroneous assumption is that Cinco de Mayo is Mexican Independence Day (which is actually September 16). Rather, it’s an observance of the Mexican military’s defeat of French forces at the Battle of Puebla. And one of the most esteemed recipes is in Puebla is molé. Molé (pronounced mo-lay) is a complicated concoction. Likely, the one most Americans recognize would be molé poblano, an aromatic mixture of (to name a few ingredients) chiles, spices, nuts, and chocolate. Another popular sauce is molé verde, made with pumpkin seeds and tomatillos. This particular interpretation has been adapted from a recipe found in the third edition of On Cooking (2003). And I won’t skirt the issue: This sauce takes a little work. But like most gastronomic tasks that require time and attention, you (and your hungry amigos) will be richly rewarded. Happy Cinco de Mayo, dear reader, and viva Mexico! 1 ounce semisweet chocolate, chopped. 1. Grind cinnamon and allspice in spice grinder. Stem and seed guajillo and pasilla chiles. Break into small pieces and simmer in water for 15 minutes. Drain well. 2. Combine sesame seeds, pumpkin seeds and cumin seeds and fry them in a dry sauté pan until well toasted; reserve. Slice onion to ½-inch thick. Sauté in pan until well colored; reserve. Add tomatoes to sauté pan and allow to char slightly. Remove blistered skin and chop cores. 3. Combine cinnamon and allspice with chiles, toasted seeds, onion, tomatoes, garlic, thyme, oregano and chicken stock in a saucepan. Season with salt and bring to a boil. Reduce to simmer and cook for 15 minutes. Remove from heat, cool, and remove sprig of thyme. 4. Blend mixture in a blender until smooth. Strain through china cap (or strainer with cheesecloth) and stir in chocolate until melted. Adjust seasonings. 5. 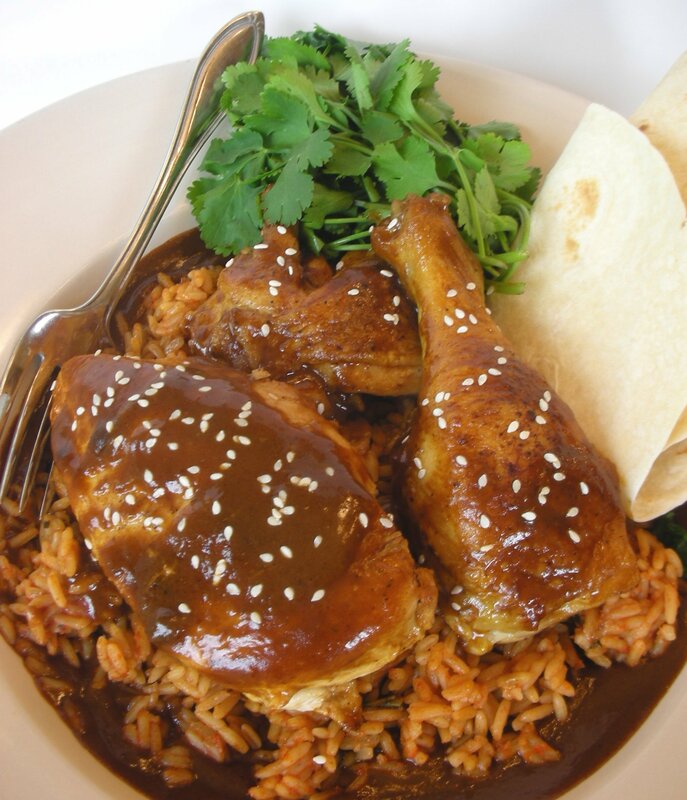 Serve mole over grilled chicken, turkey, duck, quail or a meat such as pork or rabbit.